As an avid cricket fan, Lord’s simply remains the most beautiful place in the sport. For myself, the connection also runs a lot deeper. I’m a decedent of Major William Booth, who bowled an impressive 7-21, and also took 3 wickets in 4 balls for Yorkshire v. MCC and Ground, at Lord’s in 1914. I’m sure that since 1858 the Major was amongst thousands of other young cricketers who had dreamt of the day they could perform on that very wicket, under the scrutiny of Old Father Time, and this thoroughly entertaining and well-thought-out book delves intothe deep history of the Mecca of cricket, giving us some weird and wonderful insights in the process. 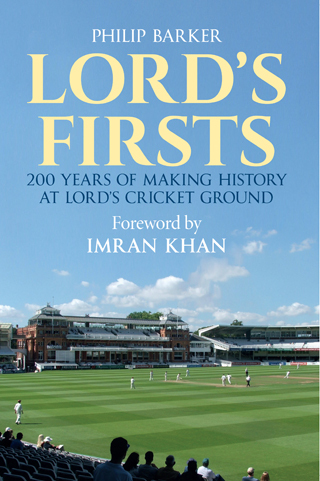 Lord’s got its name because the original ground was built, 200 years ago, by one Thomas Lord, and whilst the ground is currently in its third location, this book includes all of those significant points in its time line. It’s an informative and passionate approach by the author Philip Barker. A series of sporting firsts are described: the first test match at Lord’s in 1884, the first Sunday league match, the first time a batsman cleared smashed the ball over the pavilion – it even details the first arrest. There’s the history of the oldest running rivalry in cricket, Eton v Harrow, with the first varsity match being played in 1827. Then, in 1868, the first Australian visitors played at Lord’s, after coming over to England on a wool ship called, Parramatta. Although not even classed as an official team, they were led by an Englishman called Charles Lawrence. Arriving, without even a definite date to play, the members of the pavilion held a meeting in late March, to consider the possibility of the match going ahead. Charles Lawrence had chosen just a few ex pats to join his team of men for that game, the rest of the players being chosen from the aboriginal community, whom at the time were given no social standing in their own country. The book does not concentrate solely upon cricket. It is packed with interesting facts and stories, like how in the summer of 1894, a congress in Paris decided to revive the Olympic Games, and how the French nobleman Baron Pierre de Coubertin had drawn up a list of potential International Olympic Committee members, which included the cricketing grandee Lord Harris, which meant that leading MCC personalities played a critical role in organising the first London Olympics. Plus, there’s the origins of the first baseball game held at the Lords ground. In January 1874 Albert Spalding, then a pitcher for the Boston Red Stockings, travelled to England as an envoy of the Boston club and the Athletics of Philadelphia. Boston and the Athletics were the distinguished baseball clubs of that time. Spalding travelled over with letters of introduction, and secured an audience in London with the Marylebone Cricket Club. He required assistance in arranging a series of baseball exhibitions and offered the vision of Anglo-American cricket matches as further enticement. After a few exhibitions in Liverpool and Manchester, the Americans travelled to London where they were feted by the Marylebone Cricket Club. Before a bank-holiday crowd of 5,000 on August 3, Boston routed the Athletics, 24–7, on the hallowed Lord’s Cricket Ground. The Americans also strived to play their hosts in cricket over August 3 and 4. With tales of hot air balloonists, matches being bombed and the first test match hat-trick, accompanied by stories of heroes alike, this book is not just for the cricket lover. It portrays a social history around the sport – and the good, bad and weird that it can sometimes produce.